City of Beauty Fabled New Orleans, with its breathtaking buildings and romantic history, is the picture of elegance and sophistication. It is both vibrant and dignified; the elegant jazz music born in the city's streets reflects its soul. No other city so mixes its grace and its passion. City of Sin But there are vampires here. Any place so alive cannot help but attract the immortal parasities who seek to steal this life energy for themselves. The Damned are an intrinsic part of New Orleans. They built it...and they may tear it down. 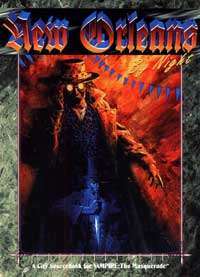 New Orleans by Night includes: A detailed description of New Orleans, including the bloody history of its founding and the bloody intrigues that threaten to destroy it; Mighty Kindred from around the world who make their way to the Big Easy; "D'Jabbic," a complete Vampire story immersing characters in New Orleans' evil.